Our Droewors are made by our own fair hands at Billies and Tong HQ. We have 2 delicious flavours to tempt you, Original and Garlic. Which one will become your favourite? Our Droewors come in heat sealed bags to seal in the flavour and have a shelf life of 3 months. Each bag is filled with 250g of mouth watering handmade droewors. You can purchase our multi buy option of 1kg, sent as 4 250g bags! what are you waiting for? Order now! Please note some products may contain or have traces of nuts and nut oils or may have been made alongside other products containing nuts. 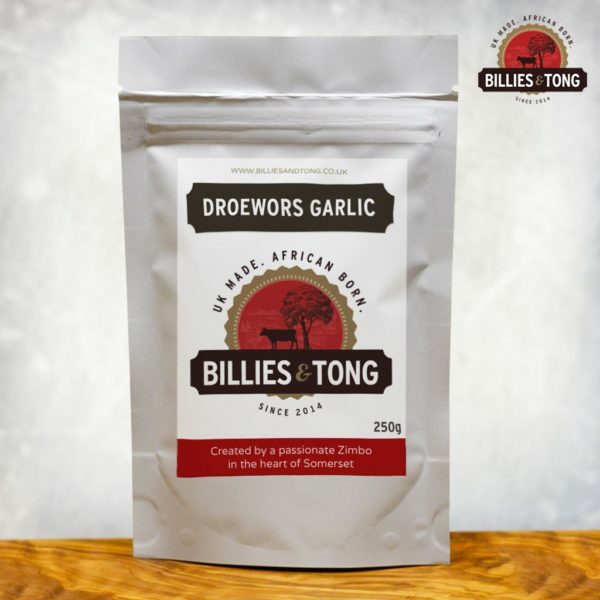 Billies and Tong cannot be held responsible for any issues resulting in food allergies.